Fearless. That was Mike Garcia. In his nearly 40 years with the labor movement, Mike never backed down from a fight. He was fierce, passionate and unwaveringly committed to social and economic justice, especially for low-wage workers most in need of a voice on the job. Mike passed away over the weekend after an illness. Today, the entire California labor movement mourns his loss with his family, friends and brothers and sisters at SEIU-USWW. Mike’s career in labor began in 1980, organizing janitors in multiple cities. To Mike, organizing wasn’t a job; it was a calling. Immigrant janitors are among the workers most in danger of exploitation. Giving those workers a voice was the driving force of his career. As the leader of SEIU local 1877, Mike led success organizing campaigns for janitors at tech behemoths like Oracle and Apple. In 2000, Mike led a three-week strike of janitors in Los Angeles, a bold action that led to dramatic gains for those workers and was the impetus for a powerful movement of low-wage workers in LA that continues to this day. Mike didn’t organize from behind a desk. He organized in the streets. At the worksite. At the homes of his members. It was a 24-hour, 365-day job. That’s what his members loved about him. He wasn’t just their leader. He was their friend. He was one of them. 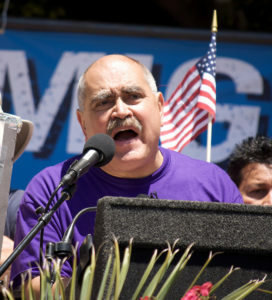 His fierce commitment to worker justice led to the expansion of Local 1877, and in 2010, Mike became the leader of a new 40,000-member strong statewide union representing property service workers, SEIU-USWW. Mike was also a powerful voice for all workers through his role on the Labor Federation’s executive council. Mike would challenge us to be bolder, to take risks and to never forget that at the core, we’re all organizers. His leadership helped unions lead the fight to defeat Meg Whitman in 2010, electing Jerry Brown as Governor. While there were many things to admire about Mike – his tenacity, his drive, his strategic mind, his compassion – his legacy is grounded in his ability to get his members to believe that anything is possible when they stand together to take on powerful forces aligned against them. Under Mike’s leadership, a union of immigrants rose to become one of the strongest voices for worker rights and social justice in the state of California. Those members believed in Mike, and Mike got them to believe in themselves, no matter the odds. Mike was a friend. He was a brother. And he was one hell of an organizer. While we mourn his passing, we know his spirit lives on in the hearts of every immigrant and worker who organized for justice. It lives on with every family lifted out of poverty because they got a union on the job. It lives on through the social justice movements Mike helped build, that gave voice to the voiceless and power to the exploited and vulnerable. We’ll miss you dearly, Mike. There will never be another like you.